For nearly 40 years until its cancellation in 2003, Tomorrow's World showcased innovations in science and technology. While some of the ideas it covered never saw the light of day, other reports demonstrated a truly impressive level of prescience. Some of the seemingly far-fetched technologies the show featured are today taken totally for granted, though the presenters were quick to point out their potential social cost as well as technological usefulness. 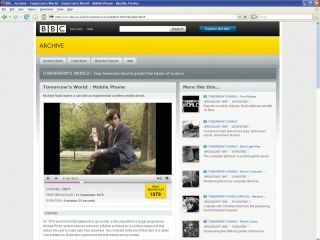 If you fancy enjoying it all again, the BBC has now made available an archive of many clips and some entire shows. Here, then, are a few gems from the vaults. One of the most accurate predictions that Tomorrow's World made was, of course, the inexorable rise of the home computer. "Experts predict that within 20 years, all new houses will be built with special computer points," enthused narrator Derek Cooper. Today, we'd call these broadband routers. Linked to a mainframe computer described as a "giant brain", the terminal in the show was a crude paper teletype that clattered noisily whenever a message arrived. What the user did with all that waste paper was anyone's guess. Cashless transactions were already becoming possible in 1969, and Tomorrow's World showcased a system that looks surprisingly modern. After dialling up a bank's central computer, the shop assistant puts the customer's cash card in a slot, enters the amount he's to pay and then the customer enters a secret PIN to identify himself. However, the show also warned of the human cost of the coming cashless society, including mass redundancies. By the 1980s, the automation of many banking services did indeed lead to extensive restructuring. Michael Rodd broke the news of an ingenious British mobile phone that used a wireless transceiver to connect to the network. With no expensive mobile phone masts to erect, it could be used anywhere. Rodd demonstrated by making a phone call from a park – and even got a wrong number. However, the Post Office (which used to run the UK's phone network) didn't see the point in the development as the Home Office had refused to make the necessary radio wavelengths available for making calls. "This is a breakthrough that will affect all our everyday lives," said Judith Hann when the Post Office's Prestel dial-up service became available for people to interact with online services. She demonstrated how you could use it to do your shopping online. By the 1980s, Prestel was being taken advantage of not in the home but in travel agents' shops, where it was used successfully to check availability and book holidays until the advent of the internet. With the power of information becoming apparent, people became increasingly worried about its misuse. In 1982, Tomorrow's World reported that data was being used for dubious purposes, and identity fraud was already becoming a problem. The government proposed a register of database managers, requiring them to disclose what they were doing with our data. However, the programme worried that a new "uncrackable" 56-bit encryption system would prevent government inspection of personal data use. How times change – now we're keener to keep the government out of our personal files.